As Australia’s southernmost distillery, McHenry and Sons take advantage of the cool, moist, maritime environment for the perfect whisky-making conditions. With clear spring water running straight into the distillery from nearby Mt Arthur, McHenry and Sons specialise in hand-made, single malt Tasmanian whisky and also produce vodka and gin. 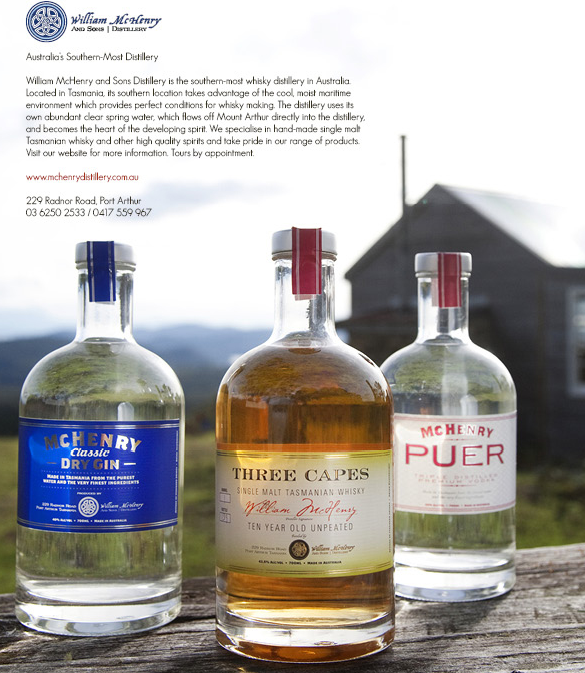 These locally made spirits are fast gaining a worldwide reputation and a bottle will make a superb Christmas present for your loved ones, or a special memento of your visit to Tasmania. The BCFM Committee thank McHenry and Sons for supporting the Farmers Market and the production of the Cook Book. McHenry and Sons are regular stallholders at the Market, so stop and have chat and a taste of their beautiful spirits and take home a bottle for yourself. Mc Henry and Sons products are also sold locally at Vines and Designs in Copping and you can also order them online. The Whisky Honey ice cream recipe below is smooth and rich, yet is surprisingly quick to make – and it would make a sensational accompaniment to a traditional Christmas pudding. Tours of the distillery are available by appointment. For more information, visit the website or contact details are below. Whip the cream until thick, adding the whisky gradually whilst whipping. Gently heat the honey in a small saucepan. Meanwhile, beat the egg yolks in a bowl until well combined. Pour the warm honey into the bowl containing the yolks and carry on beating the mixture until it is pale and thick. Gently fold the cream mixture into the egg mixture. Churn in an ice cream machine or put the mixture into a freezer proof container and freeze for a minimum of three hours before serving. Other spirits may be substituted for the whisky however take care to stick to the quantity specified as increasing the alcohol content may stop the ice cream from freezing properly.